It means that you have possibility to simultaneously create many objects in random locations and position in time. 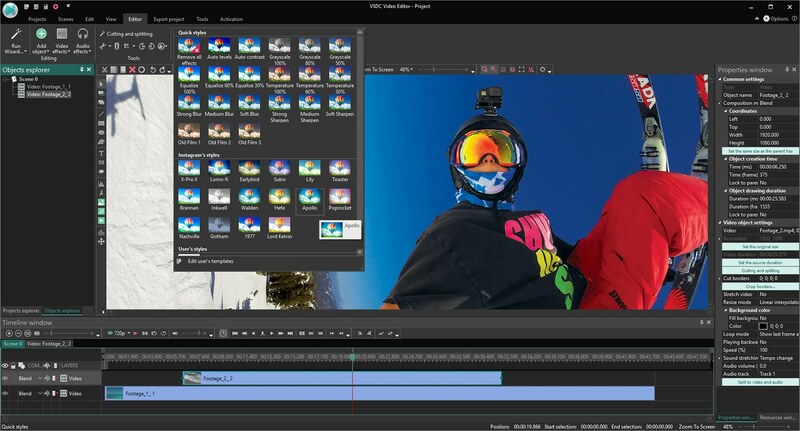 The video editor comes with video and audio conversion tools for converting files from one format to another. You can create and burn DVD’s with your videos using a built-in disk burning tool without any problems. 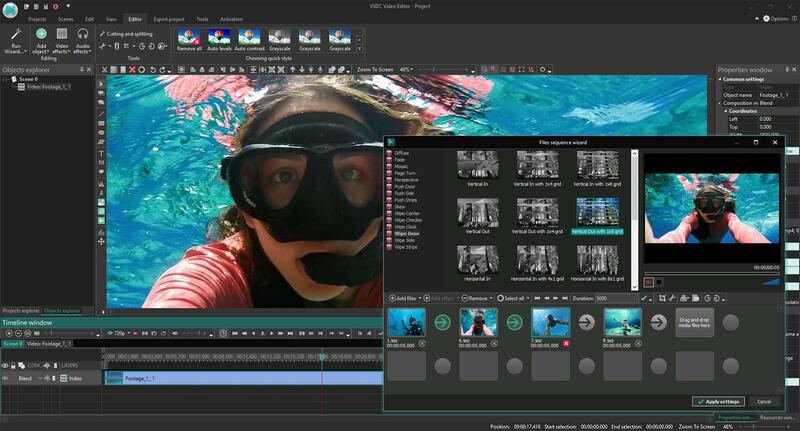 You may download Free Video Editor and use it completely free without restrictions (no trial period, watermarks, or ads). You can, however, support the project by signing up for technical support. We provide fast and full support to solve all your problems when using our products. Learn more. 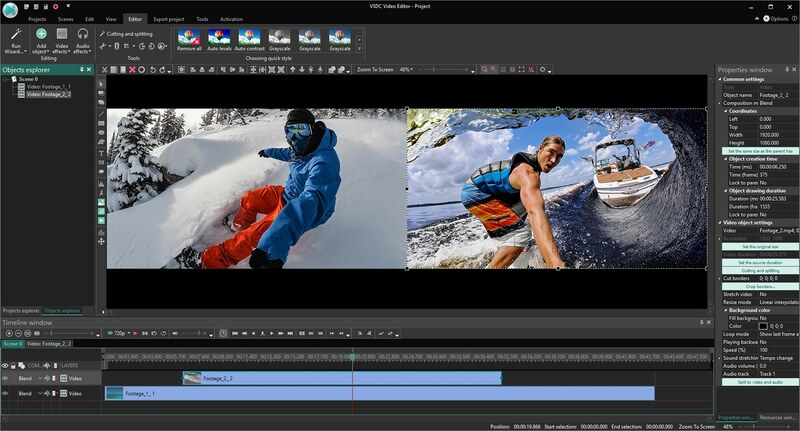 To prepare a video for Facebook, YouTube, Instagram, Twitter and Vimeo without any problems, VSDC Free Video Editor offers you special export profiles which significantly reduce the stress of selecting a suitable format and meeting all the requirements. VSDC is currently the only free video editor that allows you to export in a new H265/HEVC codec to maintain the highest quality at a minimum file size which is essential for those often processing 4K and HD files. Thanks to a large set of preconfigured profiles, you can easily create videos for most popular multimedia devices, such as DVD players, iPod/iPhone/iPad, PSP, Galaxy, any smartphones and regular phones, Sony PlayStation, Xbox, Zune, Archos, iRiver, Creative Zen, Blackberry, MP4 players and many others. Footage taken from drones, action cameras or other devices on the go often needs improvement. VSDC Stabilization tool, as your virtual tripod, helps remove jitter or any other shaking effects, caused by camera movement and turn it into a much smoother video image. 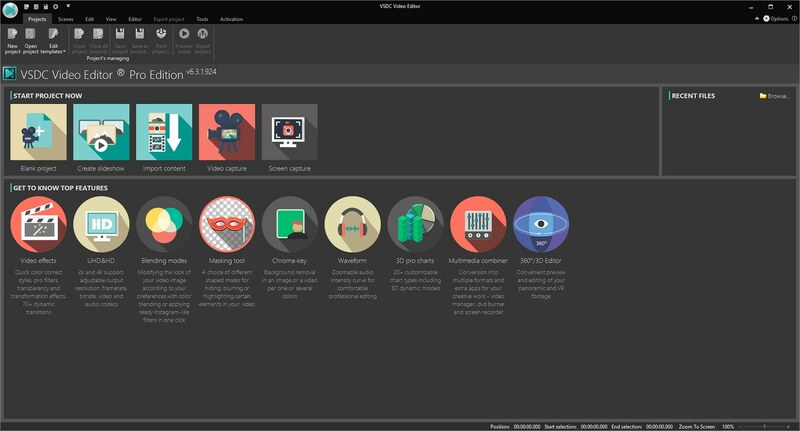 VSDC Free Video Editor not only provides ready-made profiles for exporting to social networks, but also offers you to upload your video directly to YouTube right from the app without switching windows or tabs. Basic effects window introduced with main color adjustment effects, RGB and YUV curves and quick rotation tools available from one panel. RGB Curves added as an indispensable tool for advanced color correction. rotation center can be set both according to the absolute and incremental coordinate system. New image formats supported: SVG and webP. Making an object semi-transparent made available right on the timeline. Layers order selection on the timeline added. Group operations for Rotate and Flip effects added. R and B channels correct location in the Audio abstraction restored. The program interface redesigned with black, white and other theme skins and buttons. The timeline reworked with options to minimize it and detach from the scene. 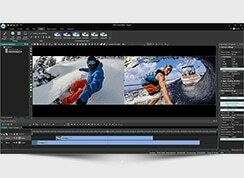 LUTs effect added to color grading tools. The video preview made available right on the scene. The ability to import and process 120 fps footage has been added. Automatic alignment in relation to other scene objects while dragging objects on the scene implemented. Scene grid can be made semi-transparent. Compatibility with Arabic symbols improved. By default the rotation center shown in the Rotate effect. ‘Video and audio not recorded in sync’ error fixed. Audio Spectrum effect added with more than 400 presets making a soundtrack visual. DeLogo effect added to the Filters section with blurring and pixelate presets. 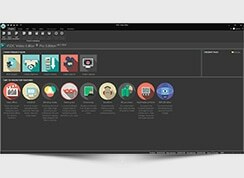 ‘Quick filters’ templates made available for editing. 'Pack project' feature added with an option to save and transfer a project file and all its input (raw) resources to another computer. Timeline styles made available for changing in the Settings. The app crashes on splitting a file into video and audio while the object is locked; previewing Reverse audio effect; using Shift, a transformation effect. Problems with sound in files with the AAC codec. 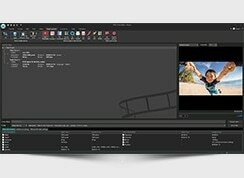 New duration of an object not updated after cutting a video file. Two 3D charts added: Step Area and Range Spline Area. Side By Side parameter added to Gantt chart and Range Bar. 3d Pie and 3d Torus chart options expanded with light and material settings. New hotkeys for adding all kinds of objects from video and sound to lines and shapes introduced. Arabic symbols (ligatures) support added. UI adapted for 4K displays. Video/audio export/import from project resources. Trim start, Trim end for cutting objects according to a cursor position. Enable Ribbon's animation/Enable toolbar's animation. Metadata caching to enable faster files opening. Noise height parameter in the BrokenTV effect. not all Gantt chart parameters available. Free shape tool added with options to draw objects using linear and spline paths. Audio Equalizer added for working with Audio effects. New deinterlacing methods added: top, bottom, top linear, bottom linear, prioridad superior/inferior de fusión, blending bottom priority. Old methods optimized. Set a cursor on the timeline (to indicate a certain frame or time). Wrong decoding of interlaced video. A 64-bit version released with a coding/decoding speed boost: in case with H265 codec, it will double the export speed and in case with other codecs, the increase rate will reach 20%. Simplified Chinese added to the interface languages. New text outline settings added: contour and dash styles. Speed-up mode crashes and audio filters failures eliminated. Wrong objects duration while applying ‘Voice over’ corrected. 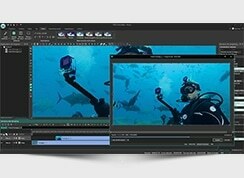 Screen recorder and video capture performance enhanced due to a new library application. Dragging/removing files for animation fixed. 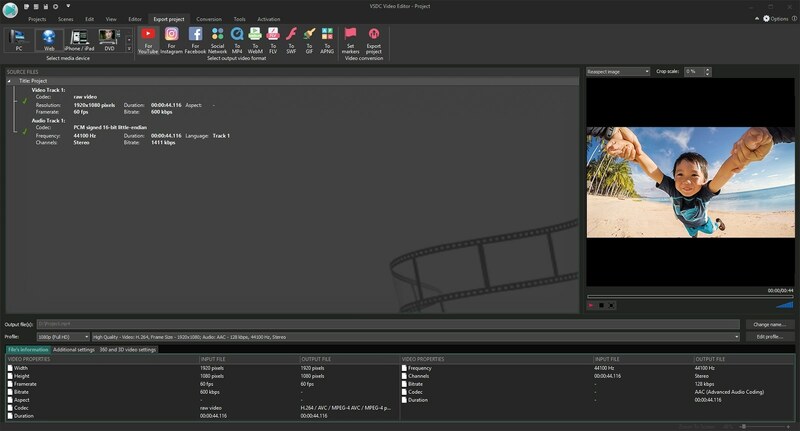 Voice over – a new embedded audio recording option allowing for adding voice commentary right to a VSDC project at required parts of the movie. Voice Recorder – a separate utility for audio recording added to the ‘Tools’ tab. The text contour tool that provides a wide array of outline presets whose opacity can be flexibly adjusted. The right to left writing option for the Arabic, Aramaic, Hebrew speaking users. Faux Bold and Faux Italic letters settings menu largely increased. The memory optimization improvement carried out increases the app performance stability and prevents it from crashes while working even with large size video files. Composition modes operations speed increased by 20 times; the Mask tool performance speed doubled. Uploading multiple videos to YouTube, if a project has been split in several files. 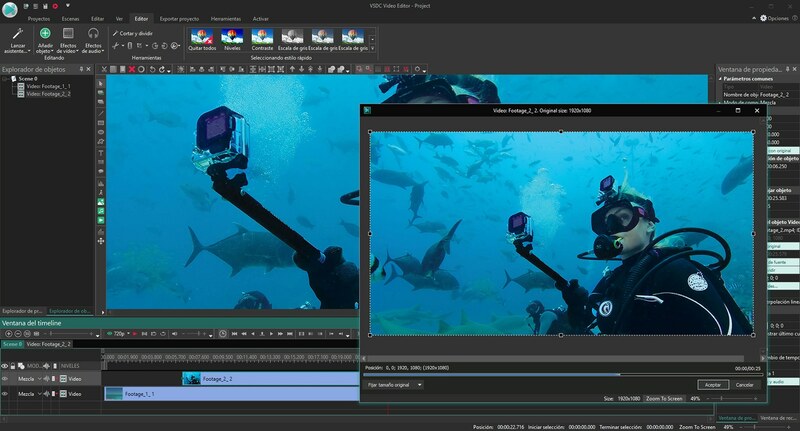 The Speeding up feature can now make videos faster up to 100х. An option to record the screen at 60 frames per second. Smoke – a special effect that helps create a smoky look of various intensity. Oil Paint – an image filter that helps attach an oil painting look similar to that of the Prisma app. Sepia and Black-and-white – effects turning videos into classic retro movies. Equalize histogram – a quick filter for increasing an image contrast. Solarize and Parabolize – effects that make video image reverse in tone. Dark areas will appear lighter and vice versa. 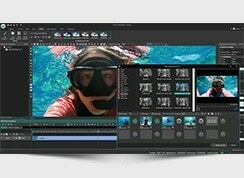 Video stabilization tool – a utility that turns shaky or jittery footage into a more stable video automatically. Counter – an object for inserting a timer that can set any time period from days to seconds or even frames. Instagram export profile– one more profile for social networks to make videos more suitable for uploading to Instagram. The Inverse effect renamed to ‘Negative’, ‘Inverse’ made a separate effect. New operation modes added to the Colorize, Threshold and Grayscale effects. Layer up/down buttons confusion fixed. Three special quality profiles for YouTube and direct upload of files to Youtube.com. One recommended export profile for Facebook. Two profiles for Twitter and four profiles for the Vimeo video sharing service in the ‘Social net’ option. New blending modes for compositing operations added: Grain-merge, Grain-extract, Dodge, burn and Divide. The Flip effect has been enhanced and made a separate tool on the quick access panel. Minor bugs fixed in: Clipping, registration, background removal. the Clipping mask effect has been made a separate effect applied in a couple of clicks. Gradient and Pattern parameters added to the Brush tool of the Shape objects, which allows for advanced multiple color correction. WebM added to supported input/output formats. Deinterlacing option with Middle and Blending methods added. The app’s performance optimized by adding a support for AVX2 processors. Mask tool added. It changes image semitransparency in required areas of the video objects and allows for adding effects only to certain parts of the video. Instagram-like filters added to ‘Quick styles’. Text object updated: superscript and subscript styles, kerning, baseline shift added, underline and strikethrough options enhanced, umlaut and stress symbols in some languages added. Scene concept modified: now all visual objects can include any other visual objects, which used to be available only for the sprite before. System clipboard processing added - an option to insert images from the clipboard, as well as video/audio/image files from the links copied to the clipboard. Filters, decoders and coders were optimized. Performance of many codecs, for example H264, was increased by more than 50%. We added a new opportunity to set zooming quality when working with images as well as to launch multiprocessing and separate coding, decoding, recording and reading processes for faster performance. APNG and GIF formats were added. The both formats enable to create videos with semi-transparence effect so that one can implement animation effects on web-sites. Quality of coded image was significantly enhanced due to dithering effect. We added compression option for SWF and GIF files which enables to significantly reduce their size. Audio format FLAC was added to enable work with audio materials without any loss of quality. We added support of 2K and 4K video as well as the opportunity to open files with H265/HEVC codec and Iphone Live Photos. Information about an author of a video, a publisher, copyright info and other data can now be recorded directly to the resulting video file. new additional settings were implemented. A new object has been added: a chart that allows you to build diagrams. A large number of various kinds of diagrams are supported, including 3D diagrams: Bar, Stacked Bar, Point, Bubble, Line, Scatter Line, Fast Line, Step Line, Spline, Area, Spline Area, Stacked Area, Stacked Spline Area, Range Bar, Gantt, Pie, Pie 3D, Torus 3D, Radar Point, Radar Line, Radar Area, Radar Spline, Radar Spline Area, Funnel, Pyramid, Pyramid 3D, High Low, Candle Stick. Effects have been added that allow you to change the tempo, speed, and pitch of the sounds being played, or play them in reverse. As a result, you can now play audio when reversing or rewinding videos. Group operations have been improved - the order in which assets are selected in the editor during group operations is now tracked. All application settings are now grouped together in the same place, which has made it possible to simply controlling the application and add additional functions such as auto-save and backup. The interface has been improved: the menus have been expanded and unified, and new menus have been added. The way sprites are drawn has been improved. You can now combine drawing objects on a sprite with effects applied to the sprite. You can now regulate volume by entering a percentage of the maximum potential volume. The regulating effect can apply to outgoing content as well as content that already has audio filters applied to it. Added the display of waveforms for video and audio objects, which allows users to edit videos on the basis of audio data (for example, cut out periods of silence). Waveforms can also be shown for audio effects. This makes it possible to precisely apply effects to the necessary fragment of a video or audio object. All parameters of audio effects can be edited in a visual editor, which enables users to make changes easier and faster. Improved a volume change effect. Volume can now change arbitrarily along a straight or curved line, or their combination (part of the Volume effect changes along a curve, part along a straight line). Changes in the license agreement – the product can now be used for commercial purposes. Editing of non-linear object parameters has been moved to the main timeline, which helped unify and simplify the interface. Besides, the change trajectory of non-linear parameters can now consist of several paths that can be both curved and straight. All static object properties can now be edited in a visual editor, which is easier and more intuitive than entering the values manually. 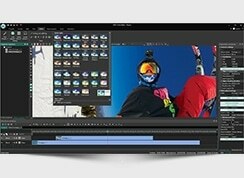 Editing of video and audio files has become more flexible and convenient. Removal and recovery of removed areas became possible not just with the help of an assistant, but also on the main timeline, which speeds up the editing process. Fixed bugs that resulted in program termination. Also fixed a bug that occasionally caused issues when certain fragments were removed from a video.